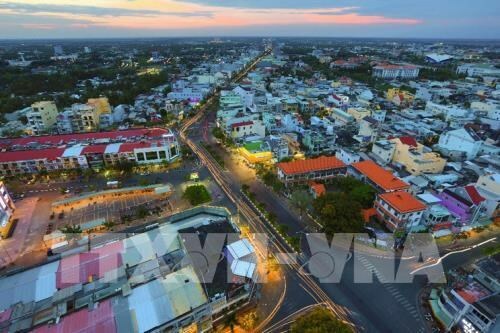 Can Tho (VNA) – More than 9,500 new businesses were established in the Mekong Delta in 2018, heard a meeting among regional business leaders in Can Tho city on March 20. The delta’s economy recorded an impressive growth of 7.8 percent in 2018, the highest over the past four years, according to Nguyen Phuong Lam, Director of the Vietnam Chamber of Commerce and Industry (VCCI)’s chapter in Can Tho. The industrial production value rose 12 percent year-on-year to 716 trillion VND (30.8 billion USD). The export turnover for the first time reached 17.5 billion USD, up 1.6 billion USD versus the previous year. Six localities posted exports worth over 1 billion USD, namely Long An, Tien Giang, Can Tho, Ca Mau, Ben Tre, and Dong Thap. In 2018, the Mekong Delta continued to be rated as the best operating area among seven regions of the country. Five localities in the delta were listed in the top 10 of Provincial Competitiveness Index (PCI), which is published annually. Lam said businesses must double their efforts to gain more socio-economic accomplishments in 2019 and the following years. He explained that 2019 is a special year for Vietnam’s economy when free trade agreements such as the Comprehensive and Progressive Agreement for Trans-Pacific Partnership (CPTPP) and the EU-Vietnam Free Trade Agreement (EVFTA) come into effect. Global trade disputes, fierce competition and rapid change of technology are putting great pressure on the State management reforms of businesses, he noted. Given the fact, Mekong Delta localities need more investment in infrastructure as well as a more dynamic administration to create favourable business environment, he said. At the event, the VCCI’s chapter in Can Tho signed cooperation agreements with Bac Lieu, Hau Giang and Vinh Long provinces on improving the business climate and building a competitiveness index for regional departments and localities in 2019.